Happy New Year from all of us at Powderhorn! We are stoked to welcome some REAL winter weather [finally!!!] We've gotten 9" of the famous fluffy white stuff in the last 24 hours and it's been coming down hard all day long! 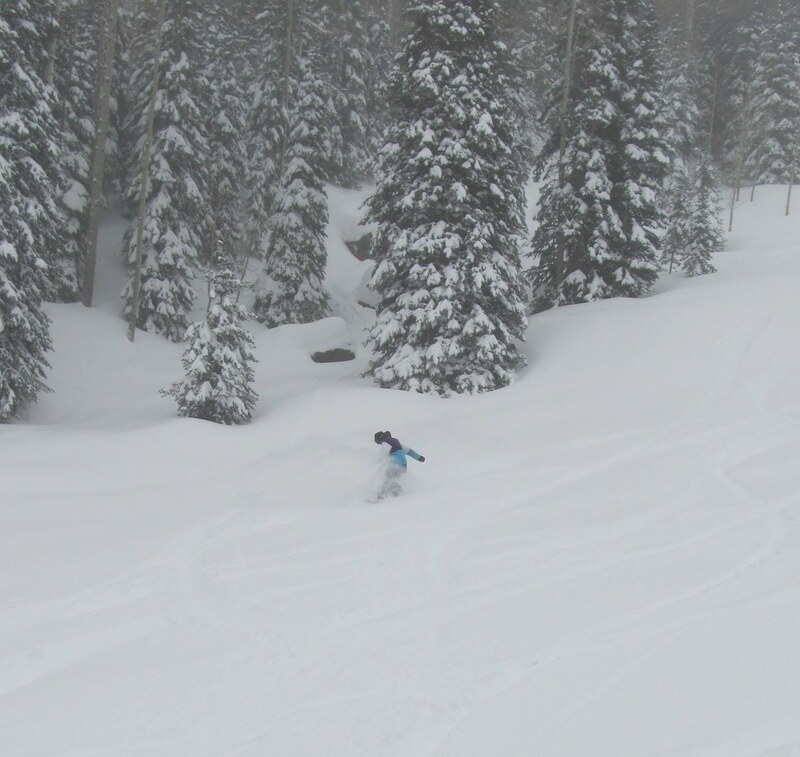 The pow is piling up perfectly since we've had no wind all day so Powderhorn is the place to be this New Year's weekend! 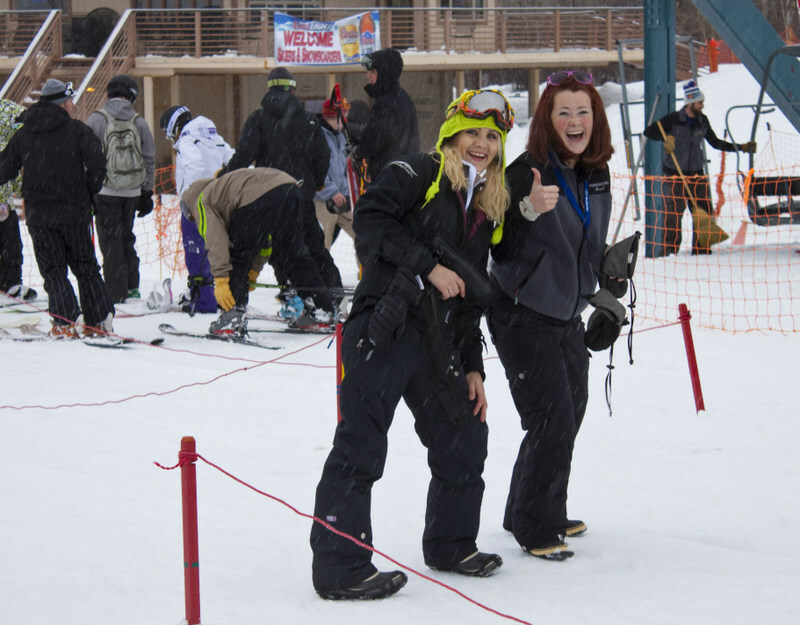 All of the runs are open with the exception of Bear Claw and upper Wonderbump. There is powder to be shredded however you do it best... get your skis or board and get here! Get it while it's light and fluffy! Above is a shot taken from the West End lift early this morning. Come to Papa you big blue blob! 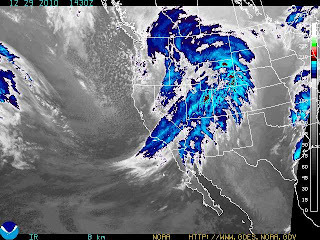 4-8" expected today and another 4-8" tonight. Schedule yourself a powder day tomorrow! 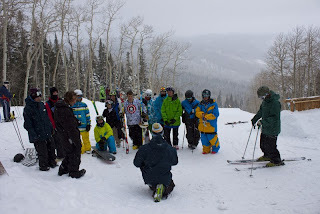 The first of two rounds of tryouts were held Sunday for the New Year's Eve Rail Jam competition here at Powderhorn. Fourteen skiers and riders had about 15 minutes to show the judges what they've got. They had as many chances as they could to jib the log natural down-flat-down rail and metal down-flat rail. 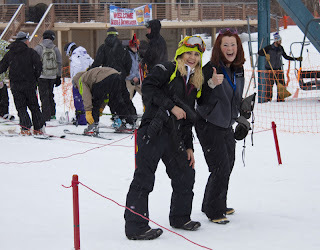 Though two contestants had to be eliminated, the element of camaraderie is key at our locals-oriented mountain. 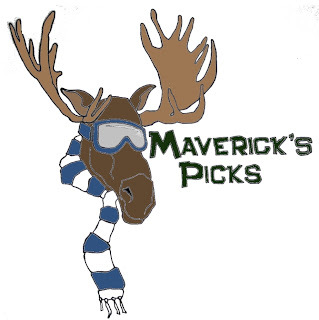 The 6 skiers who made the cut were: Jeremy Cocouz, Pat Flynn, Nick Stubler, C.J. Gonzales, Greg Houska, and Spencer Rugland. 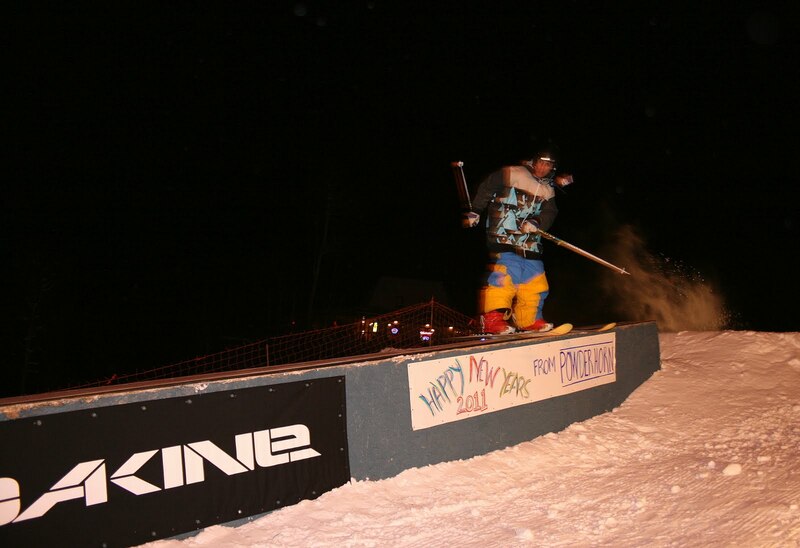 The snowboarders who will be competing on New Year's Eve are: Jesse Cocouz, Micah Hoogeven, Adam Edwards, Dillon Sullivan, Levi Garoutte, and Bryan Marz. One more rider and one more skier will be chosen Thursday. The Wild Card round will take place at 1 pm at the Top Cut Terrain Park. There is no entry fee for qualifying rounds. Run: Powderkeg is skiing so well right now and should only get better with all the snow in the forecast! Food: The Philly Cheesestake sandwich at the Skier's Union Cafe & Bar. You may want to plan ahead by wearing pants with elastic in the waist....just sayin'. Gear: All winter hats at the Alpine Trader are 25% off right now. I even found one that fits around my antlers. Apres: The Pint Club is back again at the Sunset Bar. I'm a card-carrying member again for the 2010-11 season! $8 to join, gets you the Powderhorn glass and $1 off domestic beers and wine. 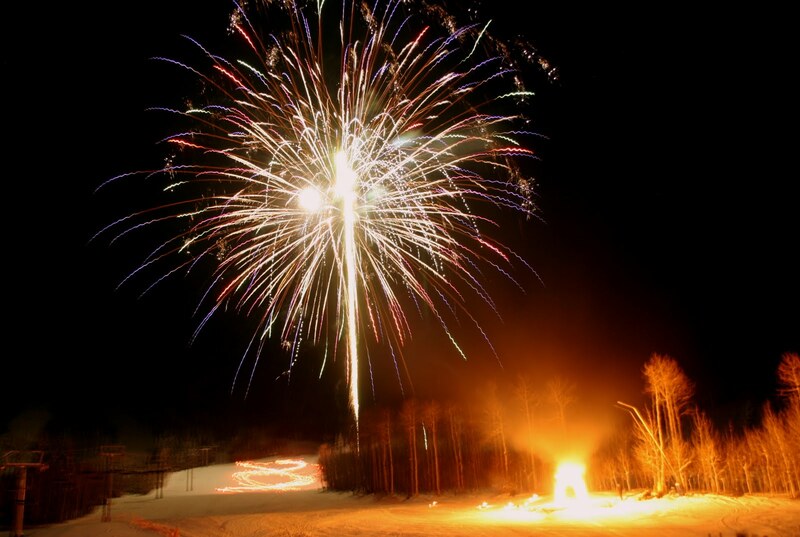 The ski patrol and ski & ride instructors will snake down the mountain with torches and jump through the ring of fire as the fireworks blast above. With powder in the forecast, it looks to be the perfect New Year's Eve! I hope you're not all partied out because we're looking for some rockstars! Rockstar presents the Dress Like a Rockstar costume contest. Winners receive $50 worth of Rockstar Energy Drink and a large pizza from the Sunset Grille. Show yourself at the Pepsi/Rockstar booth tomorrow (Sunday) at 12:30pm. You also may want to warm up your vocal cords...the Sing Like a Rockstar karaoke contest is on Tuesday from 4-6pm in the Sunset Grille & Bar. A crazy thing happened today. We opened for the season! A big thanks to all of you for hanging in there, praying and dancing for snow. And a huge thanks to all the Powderhorn employees for riding the roller coaster of the last week and getting things done. A group of us just took a run from the top of the Take Four Quad to the bottom of the West End via Maverick, Dude and Lower Snowcloud. The mountain is skiing so well! It is raining very lightly at the base area right now but snowing pretty hard on the top half of the mountain. Terrain park features will be out on Saturday. Look for 5-7 features in the Top Cut Park. 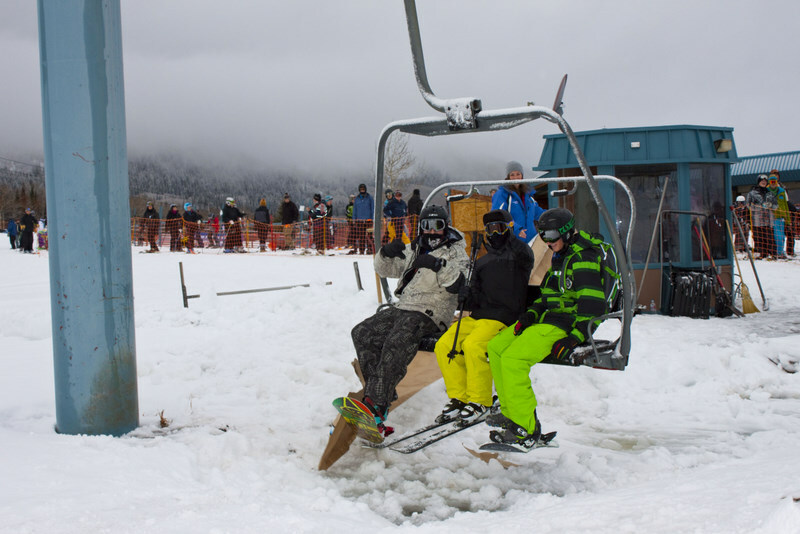 Lift tickets will be regular price tomorrow. You can pick up tickets in town at Gene Taylor's, Board & Buckle, Traz Snow & Skate, Home Loan State Bank or Sports Authority. The bus will be running tomorrow and every day throughout the school break except Christmas Day. For schedule and info click here. More snow is expected tonight! 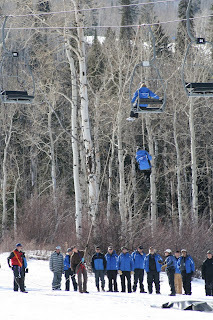 Check our snow report at www.powderhorn.com or by calling 970-268-5300. It will be posted by 6am. It feels good to be in forward motion. We're really looking forward to having you all here tomorrow. In the last 24 hours we've had 8" of snow and our base (near the top) is at 30". Preparations are now taking place to open this Thursday the 23rd at 9am. 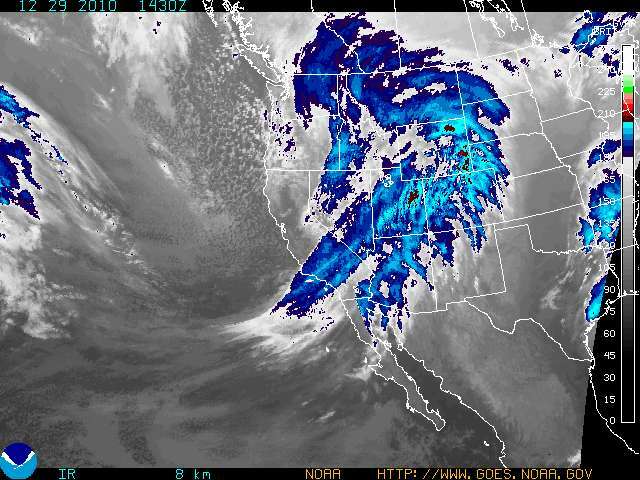 As you have seen, we've been dealing with some abnormal weather patterns the last couple days. We do have a chance again tomorrow of seeing rain/heavy sleet here at the mountain. That is the only factor that could jeopardize the Thursday plan. We'll have more information early afternoon tomorrow. This has been a decision filled with so many variables and difficult factors, but we want to get this mountain open. 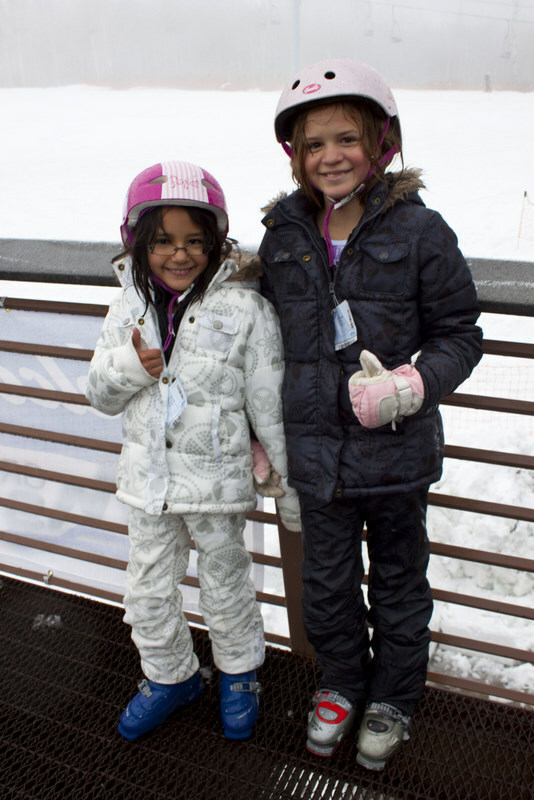 We're all ready to ski and ride! The temperatures have dropped a few degrees from what we had yesterday which is very positive. It's been snowing...sideways...all morning with wind gusts up to 35mph. We've received 5" on top in the last 24 hours. A snowcat is going out on the hill at noon to see if the lower half is firm enough to work the snow. That will tell us a lot of what we need to know right away. Our next meeting is at 1pm so look for another update this afternoon. We're looking at some interesting conditions today. The 6-10 inches forecast last night did not exactly materialize. It did snow, and is currently snowing on top of the mountain. The lower portion though....it's another story. Right now we have a very wet sleet falling at the base area. Temperatures are around 37 degrees. At this time we do not have the accumulations needed to open tomorrow. Everything we can provide to be ready has been done except grooming. We will groom the slopes the day/night before we open. However to put a snowcat on the mountain right now would cause some extensive damage to the lower half of the mountain. So what we're looking for now is colder temps. The moisture is certainly there. So maybe now we all do the temperature dance rather than snow dance! Thanks for hanging in there. You guys are great! I just spoke with our mountain manager this morning for a status report. The news just keeps getting better and better! It did not snow overnight but has started snowing early this morning. There are impressive snow totals being forecast for Powderhorn and the Grand Mesa today and tonight. Snow is expected for several days. The challenge: the low tonight could be as warm as 33 degrees which means we're flirting with rain. Right now the snow/rain line is literally just a couple hundred feet below the base. There is wind with all this snow which will actually be helpful to lower the temperature. Our patrol director is out on the mountain now taking a look at conditions. They will determine what time today/tonight the grooming crew should come in and finish prepping the mountain. Temperature is very important here. And if it should be raining, forget it. Putting a cat on the mountain would do more damage than good. But full lift operations and ski patrol crews are coming in tomorrow to set up the entire mountain- finish the lift ramps, put up the pop fence, set toboggans, etc. We're hoping for a powder day Tuesday opening! Our CEO posted this on the door of the Administration offices today. With the temperatures above normal and low early-season snowfall, we have made the decision to postpone opening day from this Thursday. Ski patrol and mountain operations staff assessed the mountain early this morning and determined conditions to be below the standards set forth by management. The most important thing to us is that we open with a safe, quality product. We all want to be out there making turns right now! But unfortunately that's not in the best interest. We're watching a storm system moving into the area Wednesday night with possible snowfall through the weekend. As soon as conditions permit we will open, even within 24 hours of the decision! It certainly feels like what's happening to us now. But we know the weather service would never mess with us. They're skiers too. Get on the snow dances people! 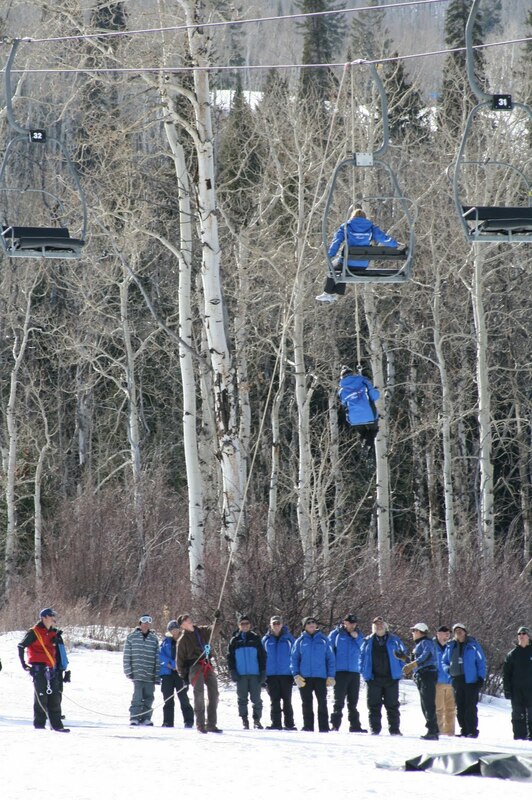 The Lift Operations team is training all week on operations and safety procedures on all the lifts at Powderhorn. Today they're working with Ski Patrol to learn the lift evacuation procedure. Our chief operating officer went out to watch the training and get a better idea of what this team does. So what did they do? Use her for practice. We're in the waiting game now. 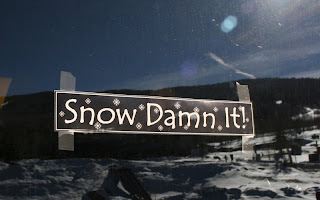 Waiting for another great storm...and even cooler temps so we can fire up the snow guns again. I (Sarah- marketing) took a run today while filming some small shots for a TV spot. The top half of the mountain isn't looking bad at all. But the lower half is where it really gets thin. There are several places with a lot of weeds coming through. 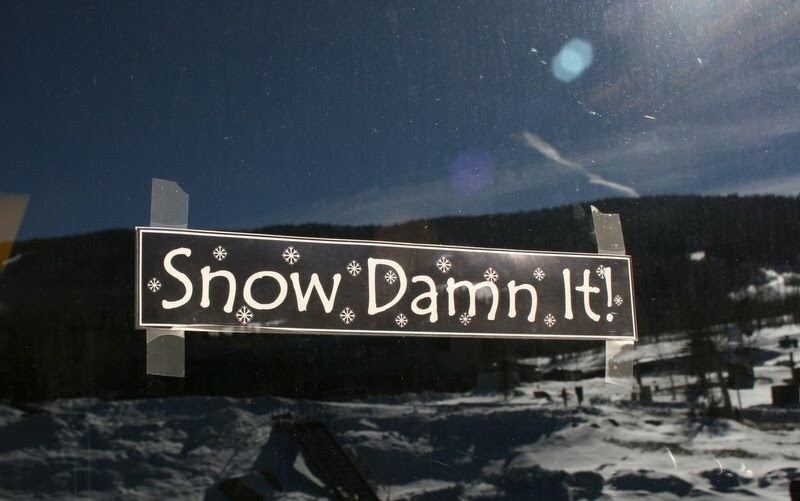 So we'll just watch the forecast and keep praying for snow! Colder temps and a chance for snow look to be on the way. We'll keep you posted! This is a new natural feature just finished in the Top Cut terrain park. It was tested and approved yesterday. Looks good to go!